Incomparable views and uncompromised peace and privacy in this rustic retreat. La Mora is a traditional, comfortable farmhouse immersed in the beautiful countryside of the Madonie Nature Reserve. The views from all points are stunning, not least from the panoramic pool. 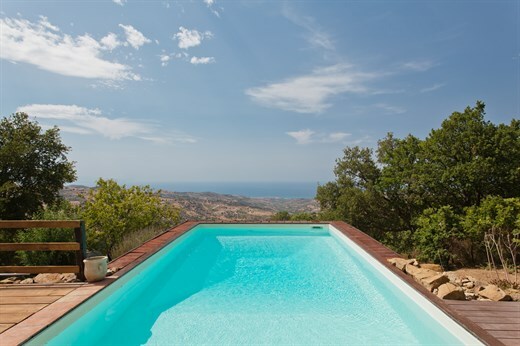 La Mora is wonderfully private and secluded and yet just a few minutes from the nearest village and a short drive to the sandy beaches that line the coast below... the perfect mix for a perfect holiday. Pool open from End of April to end of October. Inside: La Mora is accessed from a long, panoramic terrace that runs along the whole length of the house. To the right of the main entrance is the cosy living area featuring a large angular sofa, beamed ceilings and a fireplace, while straight in front of you is the well-equipped kitchen, whose original ceramic tiles hint at the property's considerable history. At its far end, the kitchen opens out onto an internal courtyard and a second kitchen area, which serves the al fresco dining areas with great ease. To the left of the entrance is the dining room, from which one accesses a single bedroom and a corridor leading to the remaining sleeping quarters: two double-twins and two bathrooms (one with a tub, one with a shower) on the ground floor, and a master double with en-suite shower room and wonderful views on the first floor. Outside: the first thing you will notice on arrival at La Mora are the breathtaking views: the sea, the north coast of Sicily and the green foothills and woodland of the Madonie Mountains. On two sides of the house there are large panoramic terraces, one particularly suited for outside dining, while a lovely grassy knoll, complete with shady oak tree, provides the perfect spot for sunset watching. Accessed from the kitchen, is lovely internal courtyard, where you may also dine. Below the house, accessed by a path with steps through the gardens, is the glorious, decked pool and a private wood with picnic area. The extensive grounds of La Mora have some drops and/or steep slopes, so we recommend that younger children are supervised by an adult when exploring the property. La Mora is situated on the western flanks of the Madonie Mountains and National Park. It is therefore ideally placed for excursions into some absolutely beautiful countryside, hill walking and interesting visits to the Mediaeval hilltop towns that populate the area. La Mora is a 2km walk to the entrance of Collesano town (for shops, bars and other amenities) and just under 3km to an agriturismo restaurant. The country road to Collesano is not a busy one, but doesn't have footpaths nor lighting at night. For motor-racing enthusiasts Collesano is also home to the Targa Florio Rally Museum. The beach of Cefalu' is about 20 minutes away, while Palermo is just over an hour’s drive down the motorway. "The setting and the views were beautiful." We loved La Mora, and our expectations — which were fairly high — were exceeded. We found it very special — thank you for sharng it! La Mora is delightful and it was a delightful holiday. We will definitely use The Thinking Traveller again. We had a perfect week in a beautiful villa on a stunning island. We can't wait to explore more of Sicily's culture and history, which might take several years! La Mora was very comfortable, spacious and clean, the kitchens were useful and there were plenty of kitchen utensils and equipment. The holiday was knockout! La Mora was wonderful. The views, setting, people and team were outstanding. So nice and helpful. The cook was amazing. Thank you very much and will definitely recommend Thinking Traveller. Looking forward to another holiday with you in the future! La Mora was very well decorated and equipped. The views from the villa were fantastic and everything about the holiday was very well managed. The national park in which the villa was located was particularly beautiful. The setting and the views were beautiful and it was really nice to be a bit away from the city. We loved hanging around by the pool. Loved the in-villa cook on our first night and appreciated the welcome pack to stock the larder our first day. Local staff were great They gave us wonderful suggestions and were very responsive. We loved La Mora, the national park and the beaches. Wonderful, wonderful! We had a lovely holiday and loved the La Mora. We loved La Mora and our holiday. The views were to die for. In both villas, for the price we were paying, I would have expected rubbish removal to be included. We loved La Mora and its facilities... The sunsets from La Mora are already missed. La Mora was beautifully situated and the hiking and villages were what we enjoyed. We had a romantic, perfectly spent. The house and its grounds and location were absolutely superb. Breathtaking views, a lovely pool, lots of seating areas in the shade and being so high in the mountains, a cool breeze blew even in August so we were never uncomfortably hot. We loved the outdoor kitchen and the verandah for eating... It was a fantastic holiday in a wonderful house, exactly right for our family. Really nothing could have been better. Our holiday? It was brilliant! Brilliant service from Think Sicily - very impressed and a massive thank you for making our holiday so relaxing! The overall standard was great... photos of the property were accurate and compelling... We had a great time - thanks. Overall a positive experience... we were content... The staff support was excellent and responsive. We thought that the villa was really special. One of the best holidays. Setting was ideal, views amazing, good value and no other english tourists for miles and miles... really well organised and informed by thinkSicily. We were all really impressed. Just a wonderful retreat - we found it hard to do the sight-seeing we'd planned! A superb stay in a fantastic location.